The book of Ezekiel chapter 33 talks about the watchman giving warning when the sword comes upon the land. The sword came to New York City, and I was unaware. The sword came to Wal-Mart, and as a family we stopped doing business with them. Now the sword has come to Cleveland, to a place we enjoyed doing business, and I must sound the alarm. The Lord blessed us greatly in August of 2010 when He moved us to some property with a pond in southeast Bradley County. My wife and I have been granted a place that we would like to spend the rest of our days with our family. We immediately started establishing relationships with local small businesses and Southeastern Farmers Cooperative was among them. We started forming bonds with many of the people there, and it was a pleasure doing business with them until Monday, April 18, 2011. When we arrived at the coop that afternoon we parked near the front door. Before we got out of the car we saw a poster in the window that made me feel that I was kicked in the stomach. I sat in the driver’s seat for at least a minute almost in panic. 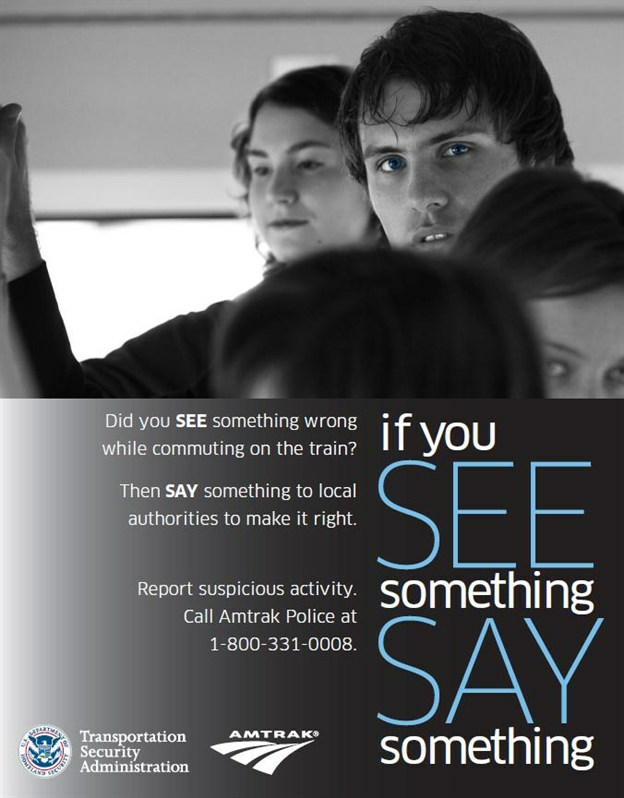 The poster was the Department of Homeland Security’s “If you see something, say something” program. I felt threatened. This sign represented an effort to turn us into a community of tattletales. This is a very serious issue. It is a very personal issue because of my family legacy and my own advocacy. We did go into the store as we needed feed for our donkey. I pointed out the sign and expressed my concern. One individual was unaware that the sign was there. Another said it was because someone could buy fertilizer supplies for bomb making, but is this really something customers need to be brought into? I expressed my concern that we were becoming like Nazi Germany. This is where my family legacy was brought from distant memory to vivid reality. My dad grew up in Chicago as an orphaned son of Polish immigrants. My mom was born in 1920 to a German military officer. I have a fondness for my grandfather, even though he died before I was born. My grandmother spoke lovingly and respectfully of him and that must have been infectious. 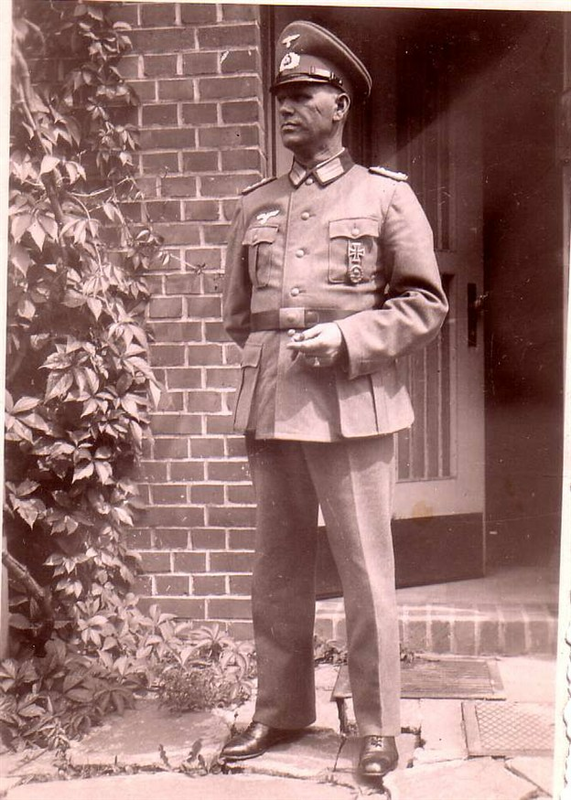 I value the picture I have of him in his uniform wearing his Iron Cross. However, with that love and respect comes a great concern. I do not know him, his beliefs, or his activities. There are questions about a picture of my grandparents, my mom, and some others in their dining room. The walls of the room are decorated with pictures, including one of my mom as a little girl. 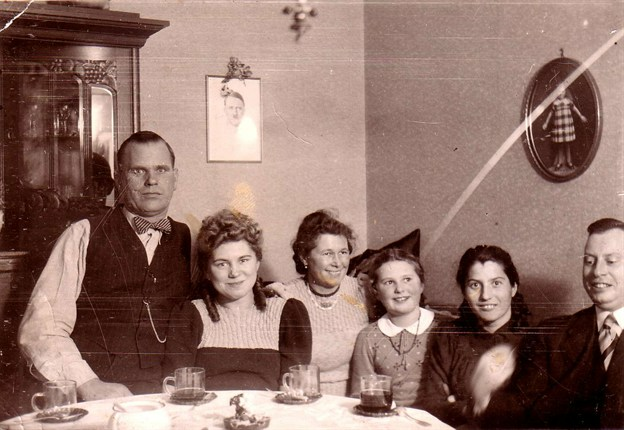 However, directly behind them is another picture with a flower draped over it of Adolf Hitler. I do not know if this was motivated out of joy or fear. I do know that this is not a movie set or a fictional story, but the home my mom grew up in. During the early 1940s, as Nazi Germany was on the offensive in World War II, my mom was working as a secretary for German Officers in Poland. All I have been able to find out is that she worked with some type of supply group. Nearby were the concentration camps. Nearby people were dying because somebody saw something and said something for the crime of being a Jew. The Nazis had turned the country into a community of tattletales. Schoolchildren were taught to inform on their parents. Neighbor was to report on neighbor. This is the history of Nazi Germany and my personal heritage. Engraved in stone at nearby Auschwitz is “The one who does not remember history is bound to live through it again.” Are we remembering? A memorial at Dachau states in several languages “Never Again.” Never seems to only apply to one generation. 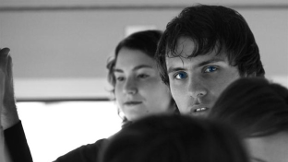 The Department of Homeland Security is employing the same technique of turning the community into tattletales. We are being made into a society where we are to fear our neighbor for what they might do. Even more, we must fear our neighbor for what they might hear or see us do. The DHS expresses concern when someone is prolife, a homeschool family, supports the right to bear arms, especially out of concern for tyranny, supports state or national sovereignty. I am suspect in all cases. Are any of the these crimes or acts of terrorism? How many concerns would the DHS have about you? It is my hope that the Southeastern Farmers Cooperative will not only take down the signs, but repudiate them. My hope extends to all businesses of our community and beyond. Our community should be one of private families living in friendship, not minions looking for or causing mischief. Benjamin Franklin wisely said, “Those who would give up Essential Liberty to purchase a little Temporary Safety, deserve neither Liberty nor Safety.” If we become the eyes and ears of the government to spy on our peers for an appearance of safety, we will lose our liberty. We will become the land of the fearful and home of the oppressed. Please join me in warning all who become subservient to the Department of Homeland Security by posting their signs. Please thank those business that view people who come to their establishment as customers rather than encouraging them to be fellow government agents. We must cease doing business with Southeastern Farmers Cooperative, and recommend the same to others, until the sign is removed. If it is also repudiated, we will publically celebrate the courage and conviction it takes to take correction and acknowledge an error.